TEACH, ENCOURAGE GUIDE & INSPIRE. truly want to learn and excel. 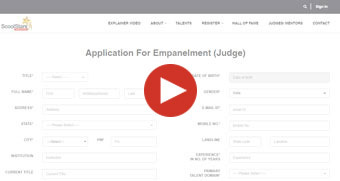 You can apply to become an empanelled judge on Scoolstars, a prestigious role for professionals with significant credentials, experience, accomplishments, formal qualifications and training in any one or more of the talent areas covered by Scoolstars. All our judges will be expected to assess the performances/skills based on talent clips (videos /images/documents) using a prescribed set of rubrics for each talent area designed and developed by Koshient Ventures Pvt. Ltd. A Judge is required to commit a minimum of one hour a day for assessment. Other details will be shared personally once empanelled as a ScoolstarsTM judge. You can apply to become an empanelled ScoolstarsTM mentor to guide and mentor students in your specialised talent area. A Scoolstars mentor must have formal qualifications, training and experience and a minimum of 5 years of experience in training students in a specific talent area either through an institution/academy, home tutoring or online . Every great achiever is inspired by a great mentor. Once empanelled, the ScoolstarsTM mentors will receive requests from Scoolstars to tutor students in specific talent areas, from and around their geographic location. Other details will be shared personally once empanelled as a Scoolstars mentor.